The Arts & Crafts style of lighting includes a number of closely related styles, including so-called Mission lighting. This is a warm and appealing style of lighting that’s become a true American classic. 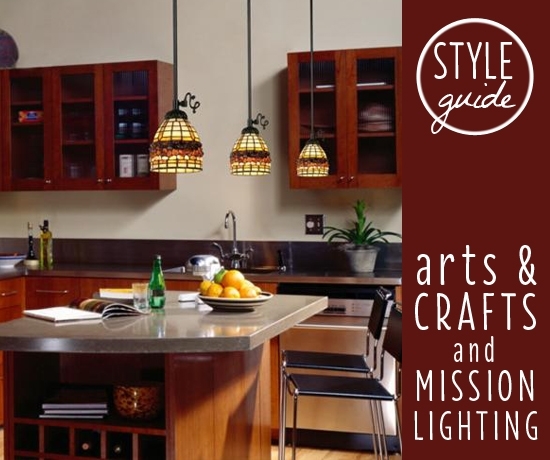 Our quick guide to arts & crafts and Mission lighting can help inspire you to adopt this timeless trend. The style may be synonymous with an all-American look, but the roots date back to the 1880s, as the Victorian age in England embraced new industrial production techniques. The Arts and Crafts movement arose as a counterpoint to this new machine age of mass produced consumer goods. Named after the London-based Arts and Crafts Exhibition Society founded in 1888, the movement embraced the hand-made, natural materials like oak, simplicity of forms, and traditional craftsmanship. Visionary designers such as William Morris and Gustav Stickley popularized the style. In Scotland, Charles Rennie Mackintosh crafted a new design and architectural vocabulary of clean, simple lines and profiles. The Arts & Crafts style also found a welcome home across the Atlantic. In America, architect and furniture designer Frank Lloyd Wright encouraged a return to the simple, functional beauty of furnishings crafted by hand. Craftsman or American Craftsman are terms often used to describe the American version of the Arts and Crafts movement. Other closely related offshoots that share the Arts and Crafts design aesthetic include The Prairie Style of architecture popular in the Midwest and Chicago, as well as California Bungalow homes on the west coast. Mission style is another offshoot of the Arts & Crafts movement. Mission style furniture and lighting is characterized by fine craftsmanship and a simplicity of line with strong and simple horizontals and verticals. Tiffany style lighting is another style that owes a debt to Arts & Crafts, with its meticulous craftsmanship and organic, natural forms such as vines, flowers and insects. Today, this warm, appealing style has won a whole new generation of admirers. Some of the movement’s most inspired designs were for lighting, and today’s Arts and Crafts table lamps, Mission style floor lamps capture that artistry for a new age. With their softly translucent shades, clean, appealing lines and distinctive style, these treasures blend with many other decorating styles, including country rustic and traditional. Arts and Crafts or Mission lighting fixtures use bronze, black or old antique finishes coupled with amber glass or mosaic glass for a soft, warm look. Tiffany style glass may be used in shade treatments. Classic glass patterns include simple architectural, geometric lines, wheat grass and other natural elements. Ceiling fixtures and chandeliers exhibit simple, clean lines, with little scrollwork or other embellishments. This is a wonderful style that’s both functional and warm, making it ideal for the multi-use rooms in today’s homes. Have Questions About the Arts and Crafts Mission Style? Contact us by phone or stop by your local Lamps Plus store to view Arts and Crafts Mission lighting in person. One of our trained lighting associates will be happy to help you shop for this beautiful and versatile lighting style.